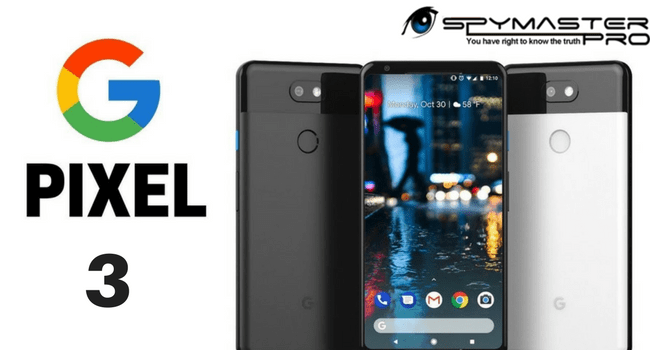 Spy on Google Pixel 3 Using Spymaster Pro! The Smartphone market is yet again ramping up to introduce its biggest launch of the year 2018 with Google Pixel 3. The launch of phone is expected to make its debut on 21st June, 2018. You all might be aware of the fact that the internet is already flooded with rumors flying that whether the launch will blow away the worldwide mobile market with its features or will it just deliver augmented upgrades. Well, whatever, it might be, we are here to ease your research about the phone by scouring the internet and collecting right information to give the best idea before you make a purchase. So, in case you wish to Spy on Google Pixel 3 Mobile Phones, then you are at the right place. Camera: The mobile has 12MP camera that supports 4000×3000 Pixel resolution, CMOS image sensor, proximity sensor, light sensor, Compass, Barometer, etc. Does this phone suit your need? Are you planning to gift this phone to your loved ones? Well, if yes, then no worries. Spymaster Pro, your most reliable spy software application tries to make all Android and iPhones compatible. So, this time too, we are happy to announce that Spymaster Pro is all set to make Google Pixel compatible. All you need to do is to just buy Google Pixel 3 and Spymaster Pro subscription and install it in the phone. Once done, you can gift the phone to your loved one and as usual the phone owner won’t be able to trace of software installation in the phone. That is, a user won’t be able to make out that you are tracking their phone. So, spy on Google Pixel 3 mobile phones using Spymaster Pro and stay informed about one’s phone activities! Chat With Us & Get Flat 50% Off!